Product #3399 | SKU AJA00029 | 0.0 (no ratings yet) Thanks for your rating! Studio or Machine room applications for converting Analog audio from decks such as Beta analog cameras into AES digital standard. Useful when an analog deck must be integrated into a digital environment. Also,good for sound rooms. 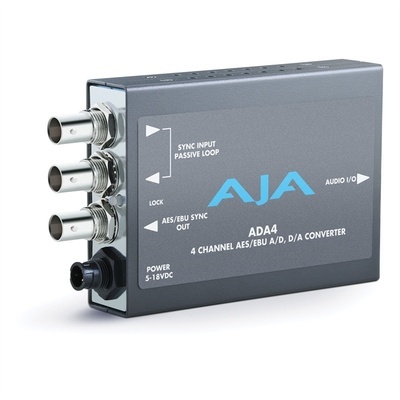 Capabilities: The ADA4 is a 4 channel converter which can be configured as a 4 channel A/D, a 4 channel D/A, or 2 channel A/D and 2 channel D/A. The ADA4 can accept a Wordclock or video sync/color black reference input for synchronization. Reference input and synchronization is automatic. Audio levels are configurable via dipswitch control. A breakout cable is included with the unit. Requires DWP or DWP-U power supply, ordered separately.